"In the heart of Italy, Harvard professor of symbology Robert Langdon is drawn into a harrowing world centered on one of history’s most enduring and mysterious literary masterpieces . . . Dante’s Inferno. Robert Langdon is being hunted, and he doesn’t know why. A failed murderous hit leaves him with retrograde amnesia, and he knows not of what he’s done to get himself into such a position. He learns of a plague about to be released to to purge the world of overpopulation and, with the breadcrumb clues, Langdon springs into action. 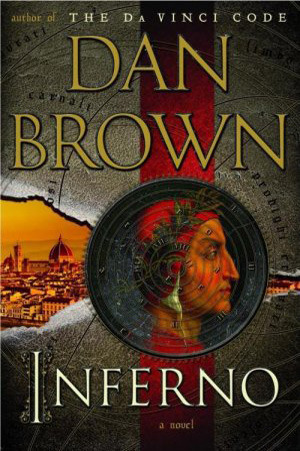 Like a needle, Langdon is plunged into the fabric of muddled chaos and has to thread himself through to find the truth; the truth of his involvement, the truth of the impending danger, the truth of the madness in inferno. Once I found the book’s rhythm, I was pleased to feel the love and thrill I usually get when reading Dan Brown’s works. Learning, studying and now an Interior Designer, I was overawed at the descriptive scenery as the author depicts the architecture, art history, symbolism and overall tone of the novel. This, along with his great characterizations, is a large part in why I love Dan Brown’s novels. The other parts are the mystery, intrigue and thrilling suspense. This book, I admit had it’s lulls, tangents and moments when it became obvious the author was stalling for pages, which significantly decreased the speed of suspense. Was it really necessary for the excessively long water limo ride, or that we learn what the metal piece on the front of gondolas mean? Probably not, yet it’s there. Although I very much appreciated the beneficial backstories of characters such as Sienna and Dr. Sinskey, I don’t believe it needed to extend towards other characters, such as the provost (normal character and persona descriptions would have sufficed.) Other than these aforementioned drawbacks, the book is very effective in displaying Dante’s Inferno in a symbolic chase to beat the clock in the containment of an impending plague. I have realized that a particular recurrent method is used in other Robert Langdon tales, but I was still quite captivated and almost flipped out at this novel’s denouement. Langdon seems to have a knack for ill-judgement. Where nothing and everything can be as it seems, there are so many questions and mysteries that can simply be solved with a single answer. That huge twist in the denouement had me mad, confused, reflective, and comprehensive all at the same time. What is supposed to may be a psychotic breakthrough for Langdon, becomes a breakdown for the readers and both have to gather up the pieces to continue on. I, myself, just about had a psychotic breakdown with Langdon as I suddenly wanted to start the book over again with a different understanding. Everything leads to the fine line between genius and madness as Langdon experiences his own fall down the rabbit hole, tumbling blindfolded through the gates of hell; a literal and psychological toll to be reckoned with. In a trail that sears through danger, treachery, morals and humanity, Inferno turns it’s eye on the social and humane issue of overpopulation, and how a single effort can affect the entire future of the world. I found this a great thriller that I would recommend to anyone who gravitates toward Michael Crichton and Stieg Larsson novels. As we’re cast to Inferno with Robert Langdon, we must journey along through the treacherous trials and obstacles to learn the hard truths that only carry us through the first summit of terror. As we attempt to conquer Inferno with Langdon, we learn that although this is the first major quest to save the world from destruction, there are more to come and we must continue this journey to Paradise looking up into the future. Into the stars. “My gift is the future.